Tokyo Dance Music Event takes place December 1-3 for three days of workshops, panels, and parties. Tokyo Dance Music Event is a new, three-day electronic music conference — the first industry event of its kind in Japan — that kicks off this Thursday, December 1 in the Shibuya ward of Tokyo. The days will be filled with panel talks and workshops, and the nights with dancing. TDME partners include renowned Tokyo night club Womb and Boiler Room, which will be throwing a party featuring Osaka producer Seiho (listen to his FADER Mix below). Speakers include Naohiro Ukawa, the founder of Japan's first live-streaming channel Dommune; Ken Hasebe, the mayor of Shibuya, who believes 21st century cities should value diversity; and Japanese hip-hop artist Zeebra. And among the many Japanese and international acts playing is Italian legend Giorgio Moroder. 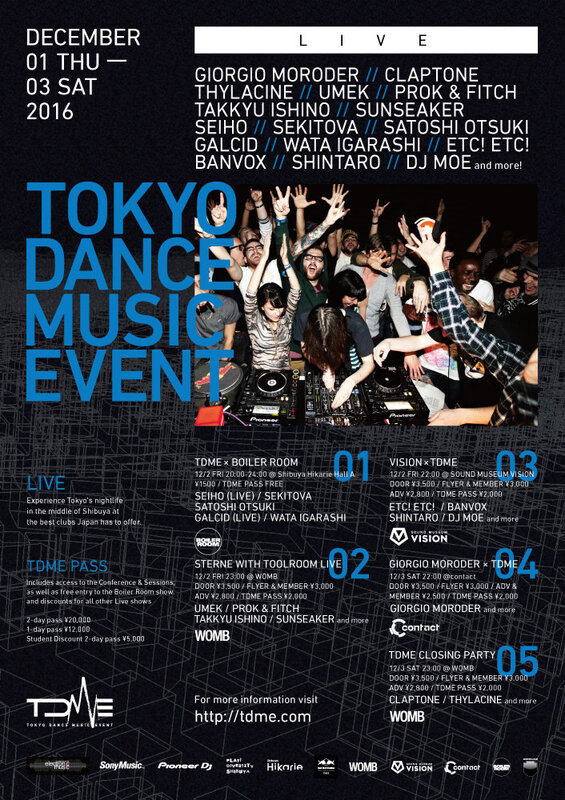 For full event and panel details, see Tokyo Dance Music Event's website.